The Dendrobates Azureus is often known simply as the Blue Poison Dart Frog. D. tinctorious is one of the largest and most variable of all dart (arrow) frog species. These bold and active frogs are found throughout the Eastern Guyana Shield of South America. Across their wide natural range, this species typically inhabits lowland rainforests, but are also found in isolated “island” forests separated from neighboring populations by miles of moist savannah. Color and pattern schemes vary tremendously amongst geographical populations, resulting in dozens of “morphs” or locales of the species. These variants are often identified in the hobby by names such as “Cobalt,” “Powder Blue,” and “Citronella,” among many others. A base color of black, accented by varying degrees of blue, yellow, and even green typify most tinctorious morphs. Usually found near the ground, D. tinctorious inhabits the leaf litter of the forest floor, occasionally ascending tree roots and similar structures in search of food and shelter. These frogs are fond of water and are known to establish home ranges near bodies of water such as brooks or seasonal ponds. Like many dart frog species, D. tinctorious is abundant in its native land. Despite the ready availability of imported specimens, the vast majority of tincs encountered in the trade are domestically produced by dedicated breeders and hobbyists. Poison Arrow Frogs are communal and best kept in a group as it stimulates natural behaviour. Poison Arrow Frogs are from Tropical climates so a glass terrarium is ideal. Glass also allows heat to escape easily so your pet will not over heat. These are terrestrial (ground) so they like to have a wide enclosure rather than a high one. For an adult or a group of youngsters a 30 x 30 x 30 cm (12"x12"x12") is acceptable. We use spagnum moss with our Poison Arrow Frogs. This absorbs water that is sprayed into the terrarium without turning mouldy. Poison Arrow Frogs like places to hide during the day. Wooden Branches and artificial plants should be used to create a forest habitat with foliage to hide in. Artificial backgrounds can be used to create a more natural effect. Poison dart frogs do well on many types of substrate. Several soil mix recipes exist, but my personal experience leads me to the conclusion that a nonorganic substrate is ideal in the wet conditions of a poison dart frog terrarium. Organic substrates rot or sour fairly quickly, and this can cause the tank to take on a swampy smell and begin to culture fungus gnats. One of the worst substrates in this regard is ground coconut husk, which rots in a matter of months. My breeding facility has been using one-eighth-inch natural aquarium gravel in tanks for many years. This substrate looks natural when the tank is decorated with plants, dried leaves, cork-bark hide spots and patches of moss. During the day Poison Arrow Frogs like to be kept at around 24oC (75 - 80oF). This can be achieved by a small heat maton the back or side of the terrarium is enough to keep your pet warm enough. Temperatures should always be checked by a reliable thermometer. Poison Arrow Frogs need a day/ night cycle in order to feel happy. We recommend a 5% UVB light and most terrariums have their own lighting canopies available to hold the light in. The light should be on for 10-12 hours per day. This can be controlled by an electric timer. Poison dart frogs are small and have delicate skin, so they’re best treated as hands-off pets. Handling poison dart frogs briefly to move them or to cup them for shipping is fine. But handling them for more than a moment or two can definitely be dangerous to their health. If you do need to catch poison dart frogs, firmly but loosely grasp them, and put them into a holding container. As stated earlier, captive-bred poison dart frogs have absolutely no poisons in their skin. However, as with any reptile or amphibian, after working with or handling your frogs, you should always wash your hands. Poison Arrow Frogs are insect hunters. These Frogs will not eat anything bigger than their mouth.Live insects like micro Crickets and Fruit Flys are particularly nutritious. Your pet deserves the best foods possible so look after your live foods. Keep your crickets fresh, plump and full of vitamins by feeding them with Bug Grub and fresh vegetation. Remember, your Poison Arrow Frog also eats whatever is in your live food's stomach. Also, don't allow your live food to dehydrate, you don't want to give your animals dried up half dead insects for dinner! Hydrate them with Bug Gel to keep them alive longer and mouth wateringly juicy. Care for your live food in their own enclosure, such as a Cricket Keeper. Live foods should be coated in a vitamin and mineral supplement such as Nutrobal to ensure the Poison Arrow Frog is getting the best nutrition possible. Water should always be made available to the Poison Arrow Frog by using a water bowl or a water feature and checked daily to ensure freshness. Humidity for this species should be high, optimally above 80%. Use of appropriate substrates and water bowls aid greatly in creating humidity, but regular misting of the entire enclosure with room temperature water will be required. In most situations, misting twice daily will suffice. This schedule may need to be adjusted based on ambient humidity, temperature, and ventilation within the cage. 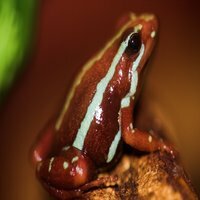 Provided the terrarium is kept clean and the water is changed daily Poison Arrow Frogs are very hardy and trouble free.